Seeing is believing! Click here Watch the FS2500 Video today! 2011+ Duramax, 6.7L Powerstroke, and Sprinter Kits in stock! The FS-2500 is a bypass filtration system specifically designed for diesel engines. Diesel engines generate a lot of soot that slowly grinds away the moving parts of your engine. Modern emission controlled engines with EGR and post-injection technology are serious offenders when it comes to oil contamination. Isn't my regular engine oil filter enough? With new diesel pickups running from $30,000 to $60,000 and replacement engines easily running over $15,000 you want to get maximum life out of your investment! Every engine needs a full-flow filter, but they have limitations. Because of the high volume of oil they must process, full-flow filters cannot be too restrictive or the filter bypass will open and your engine will receive unfiltered oil. The most efficient standard filter will remove particles down to about 25 microns. According to the Society of Automotive Engineers (Paper 881825) and a number of major diesel engine manufacturers, particles in the 4 – 7 micron range are responsible for up to 88% of engine wear. The FS-2500 is specifically designed to remove the damaging particles in this range which are NOT removed by your factory oil filter. What does a bypass filter do? Instead of filtering all of the oil used by your engine each time it passes through, a bypass filter diverts roughly 10% of an engine’s normal flow for finer filtration. The FS-2500 removes 99.63% of particles larger than 3.0 microns from the oil. The FS-2500 also removes water from condensation which causes acid buildup - it will hold almost a pint of water! Anyone who has ever disassembled a diesel engine knows what a dirty job it can be. By removing water and carbon particles, the FS-2500 will prevent the formation of this harmful sludge. Additionally, the life of the oil’s additive package (measured as TBN) will be significantly extended. Oil analysis is the ultimate proof that any filtration system is working. Oil analysis results from heavily loaded commercial equipment have frequently shown that engines equipped with the FS-2500 have less wear metal and soot contamination than they did before the FS-2500 even when oil drain intervals are doubled! Learn from the Pros! Over the Road truck drivers, using synthetic oil, have traveled 300,00 miles and more between oil changes. Fleet operators make their purchase decisions based on long-term operating costs and oil analysis not phony advertising and untested claims. Take a look at our brochure for independent test results from the highly respected Southwest Research Institute that prove the FS-2500 does just what it claims. What can the FS2500 do for me? Save your money! Most diesel pickup owners are changing the filter element in their FS-2500 at the recommended 10,000 miles, and their oil at up to 20,000 - 30,000 miles. Oil analysis will determine the best interval for your particular engine and usage patterns. Clean oil lubricates better and will slightly increase fuel economy too! The FS-2500 will pay for itself in oil changes alone, especially for those who have chosen to make the costly investment in synthetic oil. Do the math – when you factor in the time, hassle, and cost of oil changes, extended engine life, environmental costs of oil production and disposal, the FS-2500 just makes sense! Save your engine! The average oil film thickness between loaded components on an engine is in the range of 0.5 to 20 microns - imagine what a 5 micron piece of grit does when it gets jammed between a piston and cylinder wall with three microns of clearance! If you have installed a Power Chip, you are having fun, but also dumping much more soot into your engine and increasing the load at the same time – especially when you see that black smoke rolling! Taking into consideration the soot and extra loads on the engine, you cannot afford NOT to install the FS-2500! Better lubrication means more power too! You’ve done something TO your truck – how about doing something FOR it? Each kit comes custom tailored to your vehicle and engine with complete step-by-step installation instructions and color pictures. Everything needed to perform the installation such as lines, fittings, brackets, and bolts are included. Most kits have a choice of standard rubber lines or an upgrade to stainless steel braided lines. Because of their exceptional durability and security, not to mention beauty, we recommend the stainless lines. Scroll down for kit options, prices, and ordering. Will using the FS2500 affect my warranty? Properly using the FS-2500 will result in oil quality far exceeding manufacturer requirements. The emphasis of OE requirements is on oil condition, not drain intervals. Your retained analysis records are evidence. Installing a bypass filter or other vehicle accessories will not void your warranty. There are lots of products on the market, making a host of claims. We don’t put our name behind any product we don’t believe in. Remember, clean oil never hurt anything – it just makes sense! If you have not yet, consider watching the FS2500 video! All kits include FREE Priority Shipping. Please select your options for this item. Complete FS-2500 Kit for the Cummins 5.9L engine as installed in Dodge trucks. 1989-2002 kit with RUBBER lines. Includes all necessary components including lines, fittings, and detailed installation instructions with color pictures. Cummins owners have the option of choosing between the standard kit which returns filtered oil to the valve cover through an installer drilled and tapped hole in the engine's valve cover. The advantage of this option is low cost and security. For simpler installation, select the optional oil fill cap return. This kit includes a billet aluminum oil fill cap which replaces the factory oil fill cap on the valve cover. Filtered oil is returned through a swivel fitting in the billet cap to which the return line attaches. Owners of 2005 and newer Cummins engines can select between mounting their FS2500 bypass filter unit on the passenger side frame rail underneath of their truck, or mounting it to the forward portion of the cylinder head on the driver's side of the engine. Oil supply to the filter is via a factory supplied port already provided on the engine. Note: If you are ordering other items in addition to the FS2500 kit you may wish to place a separate order for them in order to maintain the "Free shipping" (USA) or discounted shipping (Canada) for the FS2500 kit. 1989-2002 kit with STAINLESS lines. 1999 and newer Cummins owners have the option of choosing between the standard kit which returns filtered oil to the valve cover through an installer drilled and tapped hole in the engine's valve cover. The advantage of this option is low cost and security. 2003-2005 kit with RUBBER lines. Owners of 2005 and newer Cummins engines can select between mounting their FS2500 bypass filter unit on the passenger side frame rail underneath of their truck, or mounting it to the forward portion of the cylinder head on the driver's side of the engine. (NOTE: If you have a factory exhaust brake, you will need to use the frame-rail mount option since the brake components interfere with the underhood mounting location. If you have a PACBRAKE, you can use either location, but may need to re-locate the PACBRAKE compressor.) Oil supply to the filter is via a factory supplied port already provided on the engine. 2003-2005 kit with STAINLESS lines. 2006-2007 kit with RUBBER lines. 2006-2007 kit with STAINLESS lines. Complete FS-2500 Kit for the Cummins 6.7L engine as installed in Dodge trucks. All years kit with STAINLESS lines. All 6.7L kits come standard with a billet aluminum oil fill cap which replaces the factory oil fill cap on the valve cover. Filtered oil is returned through a swivel fitting in the cap to which the return line attaches. The FS-2500 filter unit mounts to the frame-rail of the truck. Oil supply to the filter is via a factory supplied port already provided on the engine. All 6.7L kits come standard with stainless steel braided lines. All years kit with RUBBER lines. Oil supply to the filter is via a factory supplied port already provided on the engine. Oil returns to the engine via a carefully engineered oil drain plug that replaces the factory plug. Our Duramax stainless steel line kits are available with an oil return to filler tube option. The FS-2500 filter unit mounts to the frame-rail of the truck. Oil supply to the filter is via a factory supplied port already provided on the engine. The standard method for returning oil to the engine is via a carefully engineered oil drain plug that replaces the factory plug. An extra-cost option it to return the filtered oil to the factory oil fill tube. If you order the oil tube return option, we will send you a filler tube with a port welded into it for the return line. You will need to return your old filler tube in good condition within 30 days, at which time we will refund the core charge. 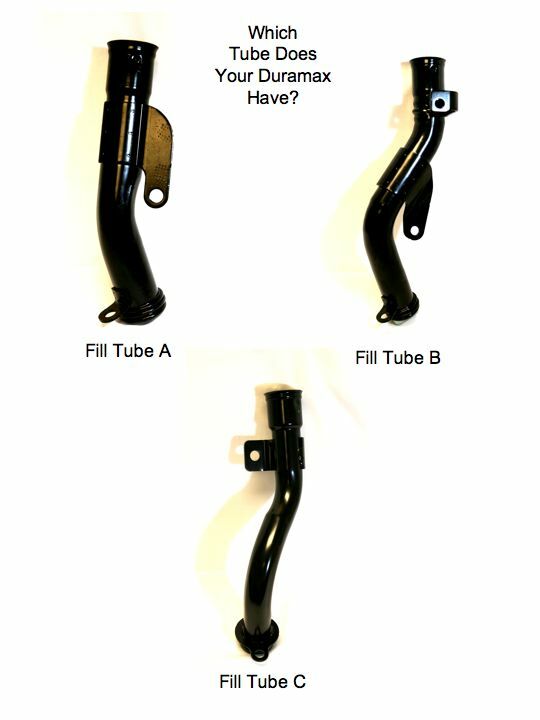 Because the Duramax engine used several different filler tube designs over the years, you will need to click on the image below to identify which tube you have, then make the correct selection when ordering. The FS-2500 filter unit mounts to the frame-rail of the truck. Complete FS-2500 Kit for the Duramax Diesel engine as installed in Chevy and GMC trucks 2011 and newer. Oil supply to the filter is via a factory supplied port already provided on the engine. Oil returns to the engine via a carefully engineered oil drain plug that replaces the factory plug. The FS-2500 filter unit mounts to the frame-rail of the truck. An optional upgrade kit allows filtered oil to return to the engine via a fitting in the oil filler tube. (A new filler tube with fitting installed is supplied with your kit. There is an additional $129 core charge which is refunded when your old filler tube is returned. Complete FS-2500 Kit for the Jeep Liberty. Filtered oil is returned to the engine via a drilled and tapped hole in the oil filler tube to which the oil return line attaches. The FS-2500 filter unit mounts to the frame-rail of the truck. Oil supply to the filter is via a factory supplied port already provided on the engine. All Liberty kits come standard with stainless steel braided lines. Complete FS-2500 Kit for the 6.0L Powerstroke Diesel engine as installed in Ford trucks. The standard kit for the 6.0L returns filtered oil to the engine via a carefully engineered oil drain plug that replaces the factory plug. An optional kit includes a billet aluminum oil fill cap which replaces the plastic factory cap. Filtered oil is returned through a swivel fitting in the billet cap to which the return line attaches. Oil supply to the filter is via an included billet aluminum oil filter cap with connection port that replaces the plastic factory cap. Complete FS-2500 Kit for the 6.4L Powerstroke Diesel engine as installed in Ford trucks. All 6.4L kits come standard with STAINLESS lines. Filtered oil returns to the engine via a carefully engineered oil drain plug that replaces the factory plug. Oil supply to the filter is via an included billet aluminum oil filter cap with connection port that replaces the plastic factory cap. Complete FS-2500 Kit for the 6.7L Power-stroke Diesel engine as installed in Ford trucks. All 6.7L kits come standard with STAINLESS lines. Oil supply to the filter is via a "T" installed between the oil pressure switch and the oil filter head. Filtered oil returns to the engine via the engine's oil filler tube. Your kit will include a new oil filler tube with a fitting installed. There is an additional $50 core charge which is refunded when you return your old filler tube to us. The FS-2500 filter unit mounts to the driver's side frame-rail of the truck. Complete FS-2500 Kit for the 7.3L Powerstroke Diesel engine as installed in Ford trucks. 1994-2002 kit with RUBBER lines. The 7.3L engine kit is a very easy installation since the engine block already includes built in ports to provide connection for the oil supply and return lines to and from the FS-2500 filter. 1994-2002 kit with STAINLESS lines. Complete FS-2500 Kit for the 6.0L Powerstroke Diesel engine as installed in the Ford Excursion. All 6.0L kits come standard with STAINLESS lines. An optional kit allows the oil to return to a short Billet Swivel Cap that fits neatly between the valve cover and the factory oil fill cap. Oil supply to the filter is via an included billet aluminum oil filter cap with connection port that replaces the plastic factory cap. Complete FS-2500 Kit for the GM 6.5L Diesel engine. Includes all necessary components including lines, fittings, and detailed installation instructions with color pictures. Oil supply to the filter is via a "T" connection at the oil pressure sending unit, with oil return to the engine's oil filler tube. Complete FS-2500 Kit for the 7.3L Powerstroke Diesel engine as installed in the Ford Excursion. All kits come standard with STAINLESS lines. Complete FS-2500 Kit for the 2.7L 5 cylinder Diesel engine as installed in Sprinter Vans. All Sprinter kits come standard with STAINLESS lines. Oil supply to the filter is via an unused oil pressure port in the engine block. Filtered oil returns to the engine via a fitting which replaces the factory oil drain plug. The FS-2500 filter unit mounts to the driver's side cross-member under the vehicle. Complete FS-2500 Kit for the 3.0L Diesel engine as installed in Sprinter Vans. The FS-2500 filter unit mounts inside the engine compartment behind the driver's side headlight.